How can companies become more innovative? And what can they do to massively scale up their innovation output? The problem for one of Knack's "Big Oil" customers was not a shortage of resources or ideas. The hardest part, instead, was identifying—quickly, efficiently and accurately at large scale—the people who have the potential to come up with radically innovative ideas and who can also make these ideas a reality. This story is about a game-changing technology that transforms the existing innovation paradigm: the idea is about moving away from focusing on evaluating the merits of ideas to focusing, instead, on predicting human potential. This idea highlights the fundamental difference between a "static state" vs. "human dynamic" view of innovation; between the "software" and "hardware" dimensions of human potential. The premise underlying the “People first, Ideas Second” approach to innovation (and other domains of human achievement) is that the innate variance in people's behavioral makeup correlates strongly with the degree of success and achievement in different realms of life. In other words, certain behavioral attributes, or a certain multi-dimensional combination of attributes, increase the probability of high level of achievement. In the case of innovation potential, our data show that, statistically speaking, certain people are "wired" with the behavioral makeup that make them more likely to reach high levels of achievement and impact. Innovators, it turns out, do have a unique "knack footprint" that sets them apart from others. Traditional perspectives on innovation emphasize the importance of creating processes and organizational environments that facilitate innovation output. Yet, these traditional approaches are not engouh. They do not enable business managers, organizations, and society at large to implement a systemtic, repeatable, scalable approach to innovation -- that changes the volume, speed, and quality of our collective innovation output. We intuitively know that the right people can make the difference between ideas and results -- between abstract concepts and marketable products that solve real needs and problems. These traditional approaches therefore miss the single most important question: are the people working on "innovating" wired for innovation? What sets "innovation superstars" apart from others is the way they think, problem-solve, collaborate, synthesize information, and handle setbacks; their ability to learn over time; their ability to switch between views of the problem at hand; and the extent to which they'll persist and persevere. It is also about the way they feel about the future and their willigness to take risks and defy convention. 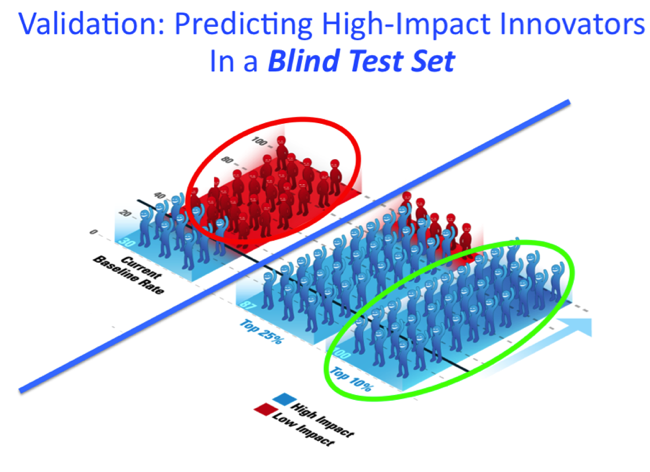 1) What is the behavioral makeup of high-impact innovators? Whether they work in a particular domain, in a specific company or environment? 2) When looking at a large population of people (be it students, R&D scientists, people at large), what is the probability of any particular having the potential for high-impact innovation? The Knack technology means that, for the first time, companies and organizations can solve these problems in a predictive, efficient and scalable way---using predictive data modeling to transform their ability to identify high-potential innovators at scale and increase innovation output. Knack, the startup behind this story, was founded in 2010. It is based in Palo Alto, California. The bios of the people involved with Knack are available below. Knack's customer, one of the global "Big Oil" companies, asked Knack to help it solve a critical business problem: radically increase its global innovation output across the company. The customer's approach to managing its innovation pipeline focused on assessing the quality of ideas submitted for consideration by would-be innovators. It is worth pointing out that while the customer developed a faily sophisticated approach to managing innovation, that approach had two main problems: (a) its "hit rate" in identifying high impact innovators was very low; and (b) the management process was high-touch, highly time-consuming, and did not scale. While digital channels, social networks, and other digital touch points make it easier than ever before for a company to source and harvest ideas from would-be innovators who submit their ideas for consideration and funding, the key limiting factor is the lack of capability to accurately and efficiently identify those who are true high potentials. This meant that even though the customer was able to leverage digital channels to "source" submissions over the web at extremely low cost and reach audiences and populations anywhere, the customer's own management process was not doing a good job in identifying the high potential innovations and was not able to do this fast enough and cheaply enough to scale this effort across a large pool of people. The combined effect of these problems produced a low ROI, and limited the customer's ability to radically transform its innovation output. In fact, without the innovation reported in this stroy, it is virtually impossible for a company's to cast a broad "digital net" to engage, inspire and attract would-be innovators and harvest ideas broadly and effectively. While coordination costs will increase as a function of volume, the time, attention, and other resources available for making the marginal decision will decrease. Key problem: What makes a successful innovator? What are the talents, abilities and traits that distinguish high-impact innovators from everyone else? Key result: Counterintuitively, Knack's data show that the idea submitted at the outset by a would-be innovator did not matter at all; rather, what mattered was the unique behavioral makeup of the person---and, in fact, Knack successfully predicted those people whose ideas turned out to be most successful based exclusively on their behavioral makeup, without having any information about the "quality" of the ideas submmited at the outset. Underlying Insight: Knack developed its innovative technology to provide a data-driven predictive insight into identifying and unleashing human potential at web scale. The technology is built on the idea that gameplay---a natural experience that engages, motivates and immerses a person completely--provides an authentic, rich insight into the person's unique behavioral makeup in a way that no other medium or experience can provide. 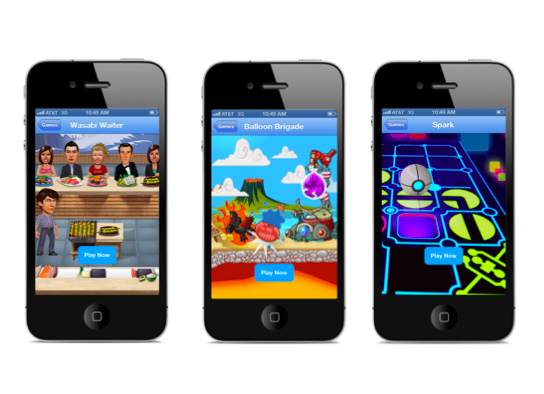 Building on this insight, Knack developed engaging mobile games that leverage behavioral neuroscience insights and data logging and data processing infrastructure to capture the rich stream of micro-behavioral data. Mining micro-behavior attribute patterns: Knack then mines the resulting gameplay data logged from the games and identifies unique behavioral marker patterns that differentiate people based on their potential for success in innovation (or in any other domain of achievement and success, eg, management and leadership, engineering, medicine, teaching, learning, etc.). Predictive Models of Human Performance: Knack discovers and quantifies the mathematical relationships between people's "knack footprint" and real-world outcomes. It provides companies, schools, and other organiztions the ability to create "signatures" that predict high-performance and achievement across a broad spectrum of jobs and fields. These "Knack Signatures" enable companies and schools to consistently and accurately identify people with the highest potential for success—at large scale. Knack games: These are accessible across web and mobile platforms. Unlike traditional methods, Knack games deliver an intrinsically engaging and motivating experience that yields high-quality data resistant to self-report bias. Knack data generate insights into domains of behavior not accessible using traditional methods. Attribute spectrum: These rich data-streams enable the measurement of a wide range of behavioral attributes—from social intelligence and personality traits to creativity, insight, risk-taking, and intelligence—and the discovery of unique patterns of behavioral markers that predict people likely to be successful on the job. 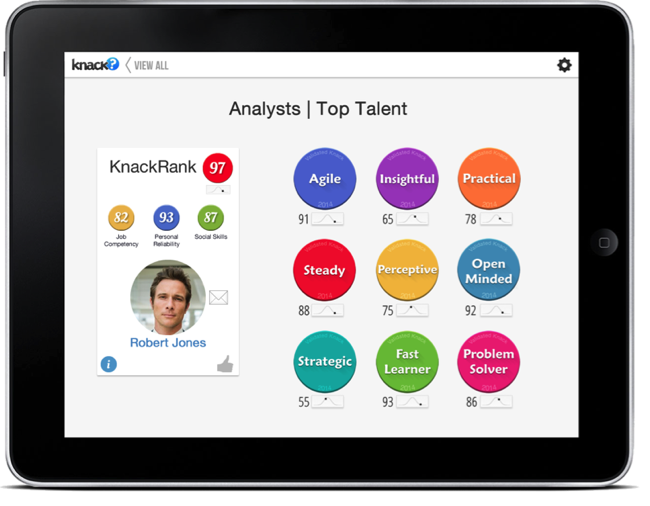 Knack worked with its Big Oil customer to uncover the Knack Signature for High-Impact Innovation and to predict people with the knack for innovation. The customer identified a group of individuals who had previously submitted ideas; they were invited to play two Knack games. 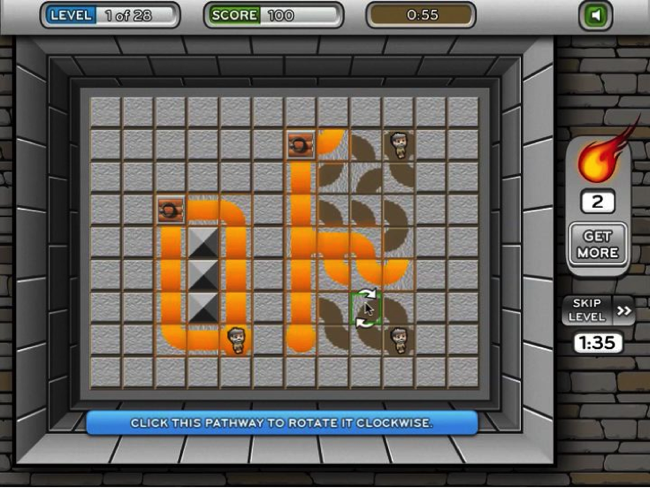 In Dungeon Scrawl, players navigate a maze and solve puzzles, requiring creative insight, among other talents and traits. 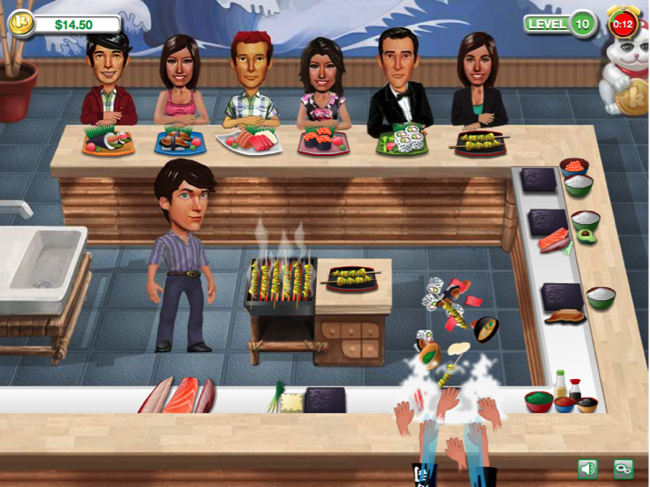 In Wasabi Waiter, players manage a flow of customers in a restaurant setting and have to recognize various social cues, requiring social intelligence and goal-orientation, among other talents and traits. In Balloon Brigade, players fill with water different types of balloons, and use them strategically to defend their water tower from the onslaught of invading creatures and to save flowers and plants from fire. 200 individuals played two games. These individuals were selected by the customer. They had worked at the customer's innovation group. The customer rated every person as high- or low-impact innovators prior to the test using a 4-point scale. These ratings were based on the performance of individuals over several years (in some cases, more than 10 years). These ratings included a measure of both (a) the volume of ideas each person created and (b) the status of the idea---i.e., how far did the person manage to get the idea towards development, testing, and commercialization. The set of 200 included a distribution of high- and low-impact innovators. Using several megabytes of gameplay data collected (per person) from 75% of the sample, Knack quantified the Knack Signature that predicts innovation performance. The signature was tested on the remaining 25% of the sample, which served as a blind test set of previously unseen individuals. Knack predictions successfully differentiated high- from low-impact innovators in the (previously unseen) test set. Knack used a continuous metric to predict people's innovation potential. Using this metric, the customer was able to ensure that, statistically, virtually every person it identifies and selects is a high-impact innovator. In addition to successfully identifying high-potentials, improving the quality of decisions, reducing costs, and shortening time to productivity, Knack enables businesses to scale up the sourcing of ideas/applicants and focus on those who are predicted to have sufficiently high potential for success. This represents a strategic shift from the "numbers game" that businesses engaged in for a very long time---and the high operating costs and error costs that that pratice produced. The bigger picture: The Knack technology offers a radically new way for quantifying human potential and predicting success and achiement—and for enabling management to harness behavioral models of human behavior and predictive insights to solve critical strategic human capital and workforce development challenges. The Importance of Adopting a "Data Mindset": Using the Knack technology successfully requires managers to adopt the emereging “big data mindset”, namely—they have to be mindful of their own decision-making limitations and be willing and keep their mind open to finding “truth” in the data. They should also let the data augment their decision-making inputs, correct for mistakes and biases, and reveal otherwise invisible relationships. The revolutionary impact of Big Data technologies in every area of business and life means that "big data mindset" is becoming a management "must have." Companies should therefore start focusing on, and developing their managers' "big data mindset"---i.e., their comfort with using "big data" tools and insights, their openness to revisiting their decisions in the face of disconfirming data. Future leaders will need to adopt and develop this mindset. Certain people may have the knack for "big data mindset", while others may not (but may be able to develop it). The bios of the Knack team are attached.